Tue 02 October 2018 by Lexfo in Vulnerability. In the previous article, we implemented a proof-of-concept that triggers the bug from userland, dropping kernel modifications made with System Tap in part 1. This article starts by introducing the memory subsystem and the SLAB allocator. Those are such huge topics that we strongly recommend the reader to get the external resources pointed out. Understanding them is absolutely mandatory to exploit any kind of use-after-free or heap overflow bugs. The basic theory about use-after-free will be explained, as well as the information gathering steps required to exploit them. Next, we will try to apply it to the bug and analyze different primitives available in our particular bug. A reallocation strategy will be presented to turn the use-after-free into an arbitrary call primitive. In the end, the exploit will be able to panic the kernel in a controlled manner (no random crash anymore). The technics exposed here are a common way to exploit a use-after-free in the Linux Kernel (type confusion). Moreover, the way chosen to exploit the use-after-free is the arbitrary call. Because of hardcoded stuff, the exploit cannot be targetless, nor bypass kASLR (the kernel version of Address Space Layout Randomization). Note that this very same bug might be exploited in various ways to gain other primitives (i.e. arbitrary read/write) and bypass kaslr/smap/smep (we will bypass smep in part 4 however). With the proof-of-concept code in hands, this is where you can actually be creative as an exploit writer. In addition, kernel exploits run in a very chaotic environment. While it was not a problem in previous articles, now it will (cf. reallocation). That is, if there is one place where your exploit can fail (because you've been raced), it will mostly be here. Reliable reallocation being an open field subject, more complex tricks cannot fit in this article. Finally, because kernel data structure layout will matter now, and those being different in the debug/production kernel, we will say goodbye to system tap as it can't run on a production kernel. It means that we will need to use more classic tools in order to debug the exploit. Furthermore, your structure layouts will mostly be different from ours, the exploit provided here won't work on your system without modifications. Get ready to crash (a lot), this is where the fun begins :-). 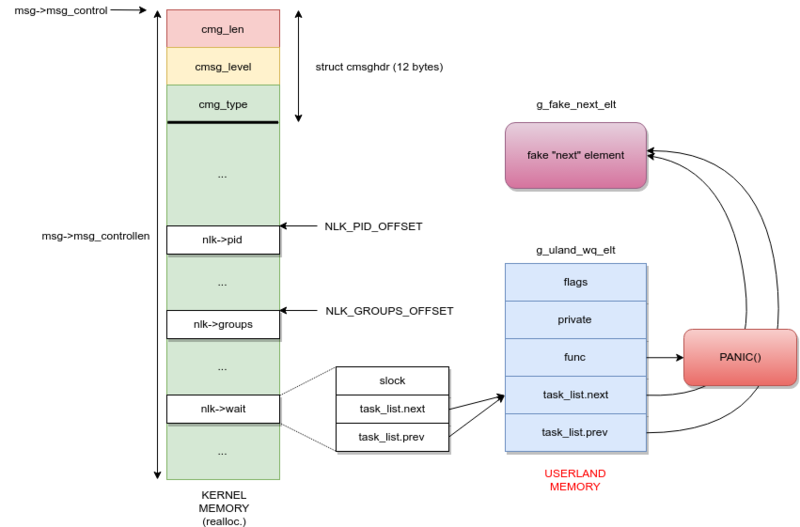 The third "core concepts" section tries to introduce the memory subsystem (also called "mm"). This is such a vast subject that books exist to only cover this part of the kernel. Because this section isn't self-sufficient, it is recommended to read the following documentations. Nevertheless, it will present core data structure of the Linux kernel used to manage memory so we can be on the same page (pun intended). At the very least, please the read the chapter 8 of "Understanding The Linux Virtual Memory Manager". In the end of this core concept section, we will introduce the container_of() macro and present a common usage of doubly-linked circular list in the Linux kernel. A basic example will be developed to understand the list_for_each_entry_safe() macro (mandatory for the exploit). One of the most critical tasks of any operating system is to manage memory. It has to be fast, secure, stable and minimize fragmentation. Unfortunately, most of these goals are orthogonal (security often implies performance penalty). For efficiency reasons, the physical memory is divided in a fixed-length block of contiguous memory. This block is called a page frame and (generally) has a fixed size of 4096 bytes. It can be retrieved using the PAGE_SIZE macro. Because the kernel must handle memory, it has kept track of every physical page frames as well as information about them. For instance, it has to know if a particular page frame is free for use or not. This kind of information is stored in a struct page data structure (also called "Page Descriptor"). The kernel can request one or more contiguous pages with alloc_pages() and free them with free_pages(). The allocator responsible to handle those requests is called the Zoned Page Frame Allocator. Since this allocator uses a buddy system algorithm, it is often just called the Buddy Allocator. The granularity offered by the buddy allocator is not suitable for every situation. For instance, if the kernel only wants to allocate 128 bytes of memory, it might ask for a page but then, 3968 bytes of memory will get wasted. This is called internal fragmentation. To overcome this issue, Linux implements more fine-grained allocators: Slab Allocators. To keep it simple, consider that the Slab Allocator is responsible for handling the equivalence of malloc() / free() for the kernel. SLAB allocator: the historical allocator, focused on hardware cache optimization (Debian still uses it). SLUB allocator: the "new" standard allocator since 2007 (used by Ubuntu/CentOS/Android). SLOB allocator: designed for embedded systems with very little memory. NOTE: We will use the following naming convention: Slab is "a" Slab allocator (be it SLAB, SLUB, SLOB). The SLAB (capital) is one of the three allocators. While a slab (lowercase) is an object used by Slab allocators. The reallocation part will change depending on the deployed Slab allocator. While being more complex to understand, it is easier to exploit use-after-free on the SLAB than the SLUB. On the other hand, exploiting the SLUB brings another benefit: slab aliasing (i.e. more objects are stored in the "general" kmemcaches). The objects themselves are stored in slabs. A slab is basically one or more contiguous page frame(s). A single slab can hold num objects of size obj_size. For instance, a slab spanned across a single page (4096 bytes) can holds 4 objects of 1024 bytes. The slab management structure can be either stored in the slab itself (internal) or in another memory location (external). The rationale behind this is to reduce external fragmentation. Where the slab management structure is stored depends on the object size of the cache. If the object size is smaller than 512 bytes, the slab management structure is stored inside the slab otherwise it is stored externally. NOTE: Do not worry too much about this internal/external stuff, we are exploiting a use-after-free. On the other hand, if you are exploiting a heap overflow, understanding this would be mandatory. Retrieving the virtual address of an object in a slab can be done with the s_mem field in combination with offsets. To keep it simple, consider that the first object address is s_mem, the second object is s_mem + obj_size, the third s_mem + 2*obj_size, etc... This is actually more complex because of "colouring" stuff used for hardware cache efficiency, but this is out-of-topic. When a new slab is created, the Slab allocator politely asks the Buddy allocator for page frames. Conversely, when a slab is destroyed, it gives its pages back to the Buddy. Of course, the kernel tries to reduce slab creation/destruction for performance reasons. NOTE: One might wonder why gfporder (struct kmem_cache) is the "logarithm number" of contiguous page frames. The reason is that the Buddy allocator does not work with byte sizes. Instead it works with power-of-two "order". That is, an order of 0 means 1 page, order of 1 means 2 contiguous pages, order of 2 means 4 contiguous pages, etc. These lists are stored in the cache descriptor (struct kmem_cache) in the nodelists field. Each slab belong to one of these lists. A slab can be moved between them during allocation or free operations (e.g. when allocating the last free object of a partial list, the slab is moved to the full slabs list). In order to reduce the interactions with the Buddy allocator, the SLAB allocator keeps a pool of several free/partial slabs. When allocating an object, it tries to find a free object from those lists. If every slab is full, the Slab needs to create new slabs by asking more pages to the Buddy. This is known as a cache_grow() operation. Conversely, if the Slab has "too much" free slabs, it destroys some to give pages back to the Buddy. In the previous section, we've seen than during an allocation, the Slab needs to scan the free or the partial slabs list. Finding a free slot through list scanning is somehow inefficient (e.g. accessing lists require some locking, need to find the offset in the slab, etc.). In order to boost the performance, the Slab stores an array of pointers to free objects. This array is the struct array_cache data structure and is stored in the array field of a struct kmem_cache. The array_cache itself is used as a Last-In First-Out (LIFO) data structure (i.e. a stack). This is an awesome property from an exploiter point-of-view! This is the main reason why exploiting use-after-free is easier on SLAB than SLUB. In other words, allocation/free operations have a O(1) complexity in the best scenario case. WARNING: If the fastest path fails, then the allocation algorithm falls back to a slower solution (scan free/partial slab lists) or even slower (cache grow). Note that there is one array_cache per cpu. The array cache of the currently running cpu can be retrieved with cpu_cache_get(). Doing so (like any per-cpu variables) allows to reduce locking operations, hence boost the performance. WARNING: Each object pointer in the array cache might belong to different slabs! In order to reduce internal fragmentation, the kernel creates several caches with a power-of-two object size (32, 64, 128, ...). It guarantees that the internal fragmentation will always be smaller than 50%. In fact, when the kernel tries to allocate memory of a particular size, it searches the closest upper-bounded cache where the object can fit. For instance, allocating 100 bytes will land into the 128 bytes cache. In the SLAB, general purpose caches are prefixed with "size-" (e.g. "size-32", "size-64"). In the SLUB, general purpose caches are prefixed with "kmalloc-" (e.g. "kmalloc-32", ...). Since we think the SLUB convention is better, we will always use it even if our target runs with the SLAB. In order to allocate/free memory from a general purpose cache, the kernel uses kmalloc() and kfree(). Because some objects will be allocated/freed a lot, the kernel creates some special "dedicated" caches. For instance, the struct file object is an object used in lots of places which has its own dedicated cache (filp). By creating a dedicated cache for these objects, it guarantees that the internal fragmentation of those caches will be near zero. In order to allocate/free memory from a dedicated cache, the kernel uses kmem_cache_alloc() and kmem_cache_free(). In the end, both kmalloc() and kmem_cache_alloc() land in the __cache_alloc() function. Similarly, both kfree() and kmem_cache_free() end in __cache_free(). NOTE: You can see the full list of caches as well as handful information in /proc/slabinfo. printf("ptr=%p\n", ptr);      // <----- print 0x0000aa00, the address of "f"
The Linux kernel makes an extensive use of doubly-linked circular list. It is important to understand them in general AND it is required here to reach our arbitrary call primitive. Instead of just looking at the actual implementation, we will develop a simple example to understand how they are used. By the end of this section, you should be able to understand the list_for_each_entry_safe() macro. NOTE: To keep this section simple, we will simply use "list" instead of "doubly-linked circular list". A list can be initialized with the INIT_LIST_HEAD function which makes both next and prev field point to the list itself. Nice, our code does not use struct list_head variables anymore. This section will cover the basic theory of use-after-free, expose the pre-requisites to exploit them and the most common exploitation strategy. The reason why this is a bug is that nobody knows what is in memory (pointed by ptr) after the call to free(ptr). It is called a dangling pointer. Reading and/or writing operations are an undefined behavior. In the best scenario case, this will just be a no-op. In the worst scenario case, this can crash an application (or the kernel). What is the allocator? How does it work? What object are we talking about? What cache does it belong to? Object size? Dedicated/general? Where the object is being used after being freed? How (reading/writing)? BUG: KASAN: use-after-free in debug_spin_unlock                             // <--- the "where"
Read of size 4 at addr ffff88014158a564 by task kworker/1:1/5712            // <--- the "how"
NOTE: The previous error report has been taken from syzkaller, another nice tool. Unfortunately, you might not be able to run KASAN in your lab setup. As far as we remember, KASAN requires a minimum kernel version of 4.x and does not support every architecture. In that case, you will need to do this job by hand. In addition, KASAN only shows you one place where the use-after-free occurs. In reality, there could be more dangling pointers (more on this later). Identifying them requires additional code review. There are multiple ways to exploit a use-after-free bug. For instance, one can try to play with allocator meta-data. Doing it this way in the kernel can be a bit tricky. It also increases the difficulty that you will face while trying to repair the kernel by the end of the exploit. Reparation will be covered in part 4. This is not a skippable step, otherwise the kernel can crash when your exploit exits (we already experienced it). A common way to exploit UAF in the Linux kernel is through type confusion. A type confusion occurs when the kernel misinterprets the data type. It uses a data (generally a pointer) that it thinks has one type, while it actually points to another type of data. Because it is developed in C, type checking is performed during compilation. The cpu actually doesn't care about types, it only dereferences addresses with fixed offsets. If you tailored your exploit correctly, the only step that can actually fail is the step 3). We will see why. WARNING: Exploiting use-after-free with "type confusion" imposes that the target object belongs to a general purpose cache. If this is not the case, there are techniques to deal with that but this is a bit more "advanced", we won't cover it here. In this section, we will answer the questions from the previous information gathering step. In our target, the allocator is the SLAB allocator. As mentioned in core concepts 3, we can retrieve this information from the kernel config file. Another way to do this is to check the name of the general purpose caches from /proc/slabinfo. Are they prefixed by "size-" or "kmalloc-"? We also have a better view on what data structure it manipulates, especially the array_cache. NOTE: If you do not master your allocator yet (especially the kmalloc()/kfree() code paths), it might be time to study it now. Note that this is quite obvious in our case. Sometimes, it might take a while to figure out the object in UAF. Especially, when a particular object has the ownership of various sub-objects (i.e. it handles their lifecycle). The UAF might lie in one of those sub-objects (i.e. not the top/master one). kfree(sk);                    // <----- ...this one ? NOTE: Remember that both sk and netlink_sock address aliases (cf. part 1). That is, freeing the struct sock pointer will release the whole netlink_sock object! What cache does it belong to? Remember that Linux is an object-oriented system with lots of abstraction? We already saw multiple layers of abstractions, hence specialization (cf. Core Concept #1). NOTE: We will get back to netlink_family_ops in the next section. Unlike socket_file_ops and netlink_ops which are mostly just a VFT, the struct proto is a bit more complex. It holds a VFT of course, but it also describes information about the life cycle of the "struct sock". In particular, "how" a specialized struct sock object can be allocated. The obj_size does NOT give the final size of the allocation, just a part of it (cf. next section). As we can see, lots of fields are left empty (i.e. NULL). Does it mean that netlink_proto do not have a dedicated cache? Well, we can't conclude yet because the slab field is defined during protocol registration. We will not cover how protocol registration works, but we need a bit of understanding however. prot->slab = kmem_cache_create(prot->name,            // <----- creates a kmem_cache named "prot->name"
sk_alloc_size(prot->obj_size), 0,         // <----- uses the "prot->obj_size"
This is the only place where a protocol has the chance to have a dedicated cache or not! Since, netlink_proto_init() calls proto_register with alloc_slab set to zero, the netlink protocol uses one of the general cache. As you might guess, the general cache in question will depend on the proto's obj_size. We will see this in the next section. When netlink_create() is invoked, a struct socket has already been allocated. Its purpose is to allocate the struct netlink_sock, associate it to the socket and initialize both struct socket and struct netlink_sock fields. This is also where it does some sanity checks on the socket type (RAW, DGRAM) and the netlink's protocol identifier (NETLINK_USERSOCK, ...). In turn, __netlink_create() is the "heart" of struct netlink_sock creation. - initialize the sock's receive/send buffer, sk_rcvbuf/sk_sndbuf variables, bind the socket to the sock, etc. As we've seen during netlink "protocol registration", it does not use any slab (i.e. slab is NULL), so it will call kmalloc() (i.e. general purpose cache). Alright, we know where the netlink_sock is allocated and the type of kmem_cache (general purpose cache), but we still don't know which kmem_cache exactly (kmalloc-32? kmalloc-64?). NOTE: The struct sock_extended structure has been created to extend the original struct sock without breaking the kernel ABI. This is not required to understand this, we just need to remember that its size is added to prior allocation. That is: sizeof(struct netlink_sock) + sizeof(struct sock_extended) + SOME_ALIGNMENT_BYTES. It is important to remind that we do not actually need the exact size. Since we are allocating in a general purpose kmem_cache, we just need to find the "upper bounded" cache that can store our object (cf. Core Concept #3). WARNING-1: In "Core Concept #3", it has been told that the general kmemcaches have power-of-two sizes. This is not entirely true. Some systems have other sizes like "kmalloc-96" and "kmalloc-192". The rationale is that lots of objects are closer to these sizes than a power-of-two. Having such caches reduces internal fragmentation. WARNING-2: Using "debug only" methods can be a good starting point to get a rough idea of the target object size. However, those sizes will be wrong on the production kernel because of CONFIG_* preprocessors. It can vary from some bytes to hundreds of bytes! Also, you should pay a special attention if the computed object size is close to a kmem_cache's object size boundary. For instance, a 260 bytes object will be in the kmalloc-512 but might be reduced to 220 bytes on production (hence kmalloc-256, that would be painful). Using the Method #5 (see below), we found that our target size is "kmalloc-1024". This is a nice cache to exploit use-after-free, you will see why in the reallocation section :-). This was an easy one. Now, look at struct sock and do it... good luck! This is even more error prone, since you need to consider every CONFIG_ pre-processor macros and handle complex "union". It sounds like the perfect tool for our task. However, it requires that the kernel image has the DWARF symbols. Which won't be the case for production kernel. In part 1 we saw how to use Sytem Tap's Guru mode to write code inside the kernel (i.e. a LKM). We can re-use it here and just "replay" the sk_alloc_size() function. Note that you may not be able to call sk_alloc_size() directly because it has been inlined. However, you can just copy/past its code and dump it. Another way would be to probe the kmalloc() invokation during a socket() syscall. Chances are multiples kmalloc() will occur, so how to know which is the right one? You can close() the socket you've just created, probe kfree() and then try to match the pointers with the ones in kmalloc(). Since the first argument of kmalloc() is the size, you will find the correct one. Alternatively, you can use the print_backtrace() function from a kmalloc(). Beware! System Tap discards messages if there is too much output! Method #5 [dynamic]: With "/proc/slabinfo"
This looks like the poor man method but it actually works great! If you kmem_cache uses a dedicated cache, then you directly have the object size in the "objsize" column given you know the kmem_cache's name (cf. struct proto)! NOTE: What we do here is actually heap spraying. Then run the program, and type a key to provoke the next "allocation chunk". After some time, you will see that one general purpose cache "active_objs/num_objs" is growing and growing. This is our target kmem_cache! Alright, it has been a long way to gather all this information. However, it was necessary and allowed us to get a better understanding of the network protocol API. I hope you now understand why KASAN is awesome. It does all this job for you (and more)! There is one last thing to analyze, and this is the "how" (read/write? bad deref? how many bytes?). It will be covered in the next section. Let's get back to our bug! In this section, we will identify our UAF dangling pointers, why the current proof-of-concept code (part 2) crashes and why we are already doing a "UAF transfer" (this is not an "official" term) that is beneficial to us. Right now, the kernel brutally crashes without having the opportunity to get any error from dmesg. So, we don't have any call trace to understand what is going on. The only sure thing is that it constantly crashes when we hit a key, never before. Of course, this is intended! We actually already did a UAF transfer. Let's explain it. Note the difference between socket_ptr (struct socket) and sock_ptr (struct netlink_sock). The struct file associated to our netlink socket has a ref counter of three because of 1 socket() and 2 dup(). In turn, the sock refcounter is two because of 1 socket() and 1 bind(). Now, let's consider that we trigger the bug once. As we know, the sock's refcounter will be decreased by one, the file's refcounter decreased by one and the fdt entry becomes NULL. Note that calling close(5) did not decrease the sock refcounter by one (the bug did it)! Again, close(3) did not drop a reference of the sock, the bug did it! Because the refcounter reaches zero, the sock is freed. As we can see, the struct file is still alive since the file descriptor 4 is pointing on it. Moreover, the struct socket now has a dangling pointer on the just-freed sock object. This is the aforementioned UAF transfer. Unlike the first scenario (cf. part 1), where the "sock" variable was the dangling pointer (in mq_notify()), now it is the "sk" pointer of the struct socket. In other words, we have "access" to the socket's dangling pointer through the struct file through the unblock_fd file descriptor. NONE OF THEM ACTUALLY UPDATE THE "SOCKET" STRUCTURE! Alright, we identified one dangling pointer... guess what... there are more! While binding the target socket with netlink_bind(), we saw that the reference counter has been increased by one. That's why we can reference it with netlink_getsockbypid(). Without detailing much, netlink_sock pointers are stored inside the nl_table's hash list (this is covered in part 4). While destroying the sock object, these pointers also became dangling pointers. Let's move on and understand why the kernel is crashing during the exit. It is time to understand why the PoC crashes. What happens when we press a key in the proof-of-concept code? The exploit simply exits, but this means a lot. The kernel needs to release every resources allocated to the process, otherwise that would be lots of memory leak. filp_close() calls fput() on the file pointed by "unblock_fd"
Because of this, netlink_release() is NOT a good candidate for exploitation (see next section). We have a way to trigger the use-after-free whenever we want! Now that we have identified the dangling pointers, understood why the kernel crash and thus, understood that we can trigger the UAF whenever we want, it is actually time to (finally) exploit it! "This is not a drill!" Independently of the bug, a use-after-free exploitation (w/ type confusion) needs a reallocation at some point. In order to do it, a reallocation gadget is necessary. Unfortunately, it is pretty rare to find a single gadget that can do all of this. A well-known gadget is msgsnd() (System V IPC). It is fast, it does not block, you hit any general purpose kmem_cache starting with size 64. Alas, it can't control the first 48 bytes of data (sizeof(struct msg_msg)). We will not use it here, if you are curious about this gadget, look at sysv_msg_load(). This section will introduce another well-known gadget: ancillary data buffer (also called sendmsg()). Then it will expose the main issue that can make your exploit fail and how to minimize the risk. To conclude this section, we will see how to implement the reallocation from userland. In order to exploit use-after-free with type confusion, we need to allocate a controlled object in place of the old struct netlink_sock. Let's consider that this object was located at: 0xffffffc0aabbcced. We can't change this location! "If you can't come to them, let them come to you". The operation that consists in allocating an object at a very specific memory location is called reallocation. Typically, this memory location is the same than the object that has just been freed (e.g. struct netlink_sock in our case). With the SLAB allocator, this is pretty easy. Why? With the help of struct array_cache, the SLAB uses a LIFO algorithm. That is, the last free'd memory location of a given size (kmalloc-1024) will be the first one re-used for an allocation of the same size (cf. Core Concept #3). It is even more awesome since it is independent of the slab. You will miss this property while trying to reallocate with the SLUB. That's it! The memory location of the new struct sock is the same than the (old) memory location of the struct netlink_sock (e.g. 0xffffffc0aabbccdd). We did a retake or "re-allocation". Not too bad, right? Well, this is the ideal case. In practice, multiple things can go wrong as we will see later. The previous articles covered two socket buffers: the sending buffer and the receiver buffer. There is actually a third one: option buffer (also called "ancillary data buffer"). In this section, we will see how to fill it with arbitrary data and use it as our reallocation gadget. If the provided size is smaller than that, then the size is added to the current option memory buffer size and check that it is smaller than "optmem_max" . We will need to check this in the exploit. Remember, our target kmem_cache is kmalloc-1024. If the "optmem_max" size is smaller than or equal to 512, then we are screwed! In that case, we should find another reallocation gadget. The sk_omem_alloc is initialized at zero during sock creation. NOTE: Remember that kmalloc(512 + 1) will land in the kmalloc-1024 cache. If the check  is passed, then the sk_omem_alloc value is increased by size . Then, there is a call to kmalloc() using the size argument. If it succeeds, the pointer is returned , otherwise sk_omem_alloc is reduced by size and the function returns NULL. Alright, we can call kmalloc() with an almost arbitrary size ([36, sysctl_optmem_max[) and its content will be filled with arbitrary value. There is a problem though. The ctl_buf buffer will be automatically freed when __sys_sendmsg() exits ( in previous listing). That is, the call  sock_sendmsg() must block (i.e. sock->ops->sendmsg()). In the previous article, we saw how to make a sendmsg() call block: fill the receive buffer. One might be tempted to do the same thing with netlink_sendmsg(). Unfortunately, we can't re-use it there. The reason is netlink_sendmsg() will call netlink_unicast() which calls netlink_getsockbypid(). Doing so, will deref the nl_table's hash list dangling pointer (i.e. use-after-free). That is, we must use another socket family: AF_UNIX. You can probably use another one but this one is nice since it is guaranteed to be present almost everywhere and does not require specific privileges. In the end, if we call setsockopt() with the SO_SNDTIMEO option, and giving it a struct timeval filled with zero. It will set the timeout to MAX_SCHEDULE_TIMEOUT (i.e. block indefinitely). It does not require any specific privileges. As you can see, we are now using the msg_control (hence msg_controllen is positive). That is, we can't bypass __scm_send() anymore and it needs to return 0. This is a 16 bytes data structure which must be located at the very beginning of our "msg_control" buffer (the one with arbitrary data). Its usage actually depends on the socket type. One can see them as, "do something special" with the socket. For instance, in the UNIX socket, it can be used to pass "credentials" over a socket. The control message buffer (msg_control) can hold one or more control message(s). Each control message is composed of a header and the data. That is, it checks if the provided len in msg_controllen is greater than 16 bytes. If not, it means that the control message buffer does not even hold a control message header! In that case, it returns NULL. Otherwise, it returns the starting address of the first control message (i.e. msg_control). This is not as complex as it looks!. It basically takes the current control message header address cmsg and adds cmsg_len bytes specified in the current control message header (plus some alignment if necessary). If the "next header" is out of the total size of the whole control message buffer, then it means there is no more header, it returns NULL. Otherwise, the computed pointer (i.e. next header) is returned. Beware! The cmsg_len is the len of the control message AND its header!. Our objective is to force __scm_send() to return 0 . Because msg_controllen is the size of our reallocation (i.e. 1024), we will enter the loop  (i.e. CMSG_FIRSTHDR(msg) != NULL). Because of the , the value in the first control message header should be valid. We will set it to 1024 (size of the whole control message buffer). Then, by specifying a value different than SOL_SOCKET (i.e. 1), we can skip the whole loop . 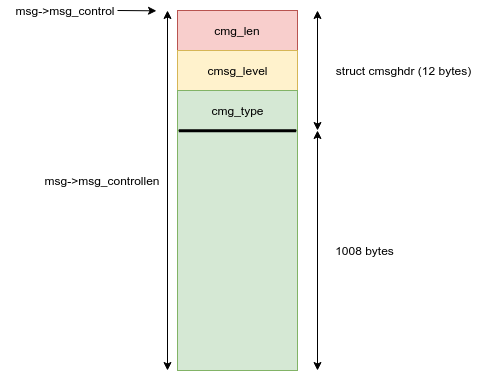 That is, the next control message header will be seeked by CMSG_NXTHDR() since the cmsg_len is equal to msg_controllen (i.e. there is only ONE control message), cmsg will be set to NULL and we will gracefully exit the loop and return zero ! Nice, we've got everything needed to reallocate in the kmalloc-1024 cache with (almost) arbitrary data. Before digging into the implementation, let's have a short study of what could possibly go wrong. WARNING: We will not cover every path of kmalloc()/kfree() it is expected that you understand your allocator by now. If the array_cache is full, it will call cache_flusharray(). This will put batchcount free pointer to the shared per-node array_cache (if any) and call free_block(). That is, the next kmalloc() fastest path will not re-use the lastest free'd object. This breaks the LIFO property! If it is about freeing the last "used" object in a partial slab it is moved to the slabs_free list. If the cache already has "too much" free objects, the free slab is destroyed (i.e. pages are given back to the buddy)! The buddy itself may initiate some "compaction" stuff (what about PCP?) and starts sleeping. The system (not because of you) is currently running out-of-memory and tries to reclaim memory from every subsystems/allocators, etc. There are other paths to consider, and the same goes for the kmalloc()... All of these issues considered that your task was alone in the system. But the story does not stop here! For instance, you just free'd the netlink_sock object, but then another task also free'd a kmalloc-1024 object. That is, you will need to allocate twice to reallocate the netlink_sock (LIFO). What if another task "stole it" (i.e. raced you)? Well... you can't reallocate it anymore until this very same task does not give it back (and hopefully hasn't been migrated to another cpu...). But then, how to detect it? As you can see, lots of things can go wrong. This is the most critical path in the exploit: after freeing the netlink_sock object but before reallocating it. We cannot address all these issues in the article. This is for more advanced exploit and it requires stronger knowledge of the kernel. Reliable reallocation is a complex topic. Fixing the CPU with sched_setaffinity() syscall. The array_cache is a per-CPU data structure. If you set a CPU mask to a single CPU at the beginning of the exploit, you are guaranteed to use the same array_cache when freeing and reallocating. Heap Spraying. By reallocating "a lot", we have a chance to reallocate the netlink_sock object even if other tasks also free'd some kmalloc-1024 objects. In addition, if the netlink_sock's slab is put at the end of the free slab list, we try to allocate all of them until a cache_grow() eventually occurs. However, this is pure guessing (remember: basic technique). Please check the implementation section to see how this is done. See? It does not move that much (at all?). Now look at "kmalloc-256", "kmalloc-192", "kmalloc-64", "kmalloc-32". Those are the bad guys... They are simply the most common kernel object sizes. Exploiting a UAF in those caches can quickly turn in hell. Of course, the "kmalloc activity" depends on your target and the processes running on it. But, the previous caches are unstable on almost all systems. Alright! It is time to get back to our PoC and start coding the reallocation. The sched_yield() syscall forces the main thread to be preempted. Fortunately, the next scheduled thread will be one of our reallocated thread, hence win the reallocation race. You can run the exploit now but you won't see anything useful. We are still randomly crashing during netlink_release(). We will fix this in the next section. "Where there is a will, there is way..."
The ultimate goal is to take control over the kernel execution flow. What dictates the kernel execution flow? Like any other program, the instruction pointer: RIP (amd64) or PC (arm). As we've seen in Core Concept #1, the kernel is full of Virtual Function Table (VFT) and function pointers to achieve some genericity. Overwriting them and invoking them allows to control the flow of execution This is what we will do here. Those VFT are our primitive gates: every single UAF primitive starts from one of those function pointers. However, we can NOT control those pointers directly. The reason being that the free'd structure is struct netlink_sock. Instead, pointers to these VFTs are stored in struct file and struct socket respectively. We will exploit the primitive those VFTs offer. Wow! This is a nice "uncontrolled read primitive" (two reads and no side-effect). We will use it to improve the exploit reliability in order to detect if the reallocation succeeds. Call getsockname() syscall and check the returned value. If the returned address matches our magic value, it means the reallocation worked and we have exploited our first UAF primitive (uncontrolled read)! You won't always have the luxury to validate if the reallocation worked or not. 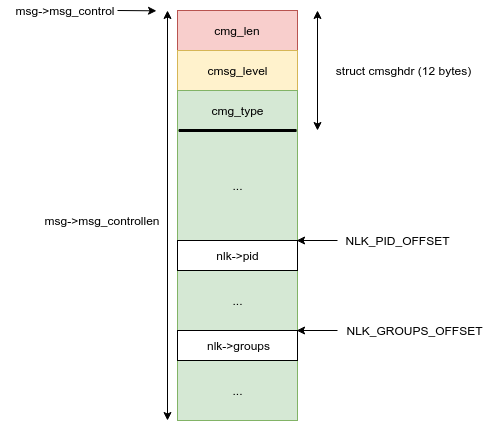 In order to find the offsets of nlk->pid and nlk->groups, we first need to get the binary in an uncompressed format. If you don't know how to, check this link. You should also take the "/boot/System.map-$(uname -r)" file. If (for some reasons) you don't have access to this file, you might try "/proc/kallsyms" which gives the same results (needs root access). Alright, we are ready to disassemble our kernel. The Linux kernel is basically just an ELF binary. Hence, we can use classic binutils tools like objdump. In our case, the netlink_getname() function will be loaded at address 0xffffffff814b6ea0. NOTE: We assume that KASLR is disabled. ffffffff814b6ea9:       48 8b 47 38             mov    rax,QWORD PTR [rdi+0x38] // retrieve "sk"
ffffffff814b6eaf:       66 c7 06 10 00          mov    WORD PTR [rsi],0x10      // set "AF_NETLINK"
ffffffff814b6eb4:       66 c7 46 02 00 00       mov    WORD PTR [rsi+0x2],0x0   // set "nl_pad"
ffffffff814b6ec0:       74 26                   je     0xffffffff814b6ee8 // "if (peer)"
ffffffff814b6ede:       89 46 08                mov    DWORD PTR [rsi+0x8],eax      // set "nladdr->nl_groups"
ffffffff814b6ee8:       8b 90 88 02 00 00       mov    edx,DWORD PTR [rax+0x288]  // retrieve "nlk->pid"
ffffffff814b6eee:       89 56 04                mov    DWORD PTR [rsi+0x4],edx    // give it to "nladdr->nl_pid"
ffffffff814b6ef1:       48 8b 90 a0 02 00 00    mov    rdx,QWORD PTR [rax+0x2a0]  // retrieve "nlk->groups"
ffffffff814b6eff:       8b 02                   mov    eax,DWORD PTR [rdx]        // otherwise, deref first value of "nlk->groups"
ffffffff814b6f01:       89 46 08                mov    DWORD PTR [rsi+0x8],eax    // ...and put it into "nladdr->nl_groups"
nlk->pid offset is 0x288 in "struct netlink_sock"
nlk->groups offset is 0x2a0 in "struct netlink_sock"
In this section, we started doing type confusion with the pid field of our fake "netlink_sock" struct (i.e. from g_realloc_data). Also, we've seen how to trigger an uncontrolled read primitive with getsockname() which ends in netlink_getname(). Now that you are more familiar with UAF primitives, let's move on and get the arbitrary call! Alright, now you (hopefully) understood where our UAF primitives are and how to reach them (with file and/or socket-related syscalls). Note that we did not even considered the primitives brough by the other dangling pointer: hash list in nl_table. It is time to reach our goal: gain control over kernel execution flow. Since we want to control the kernel execution flow, we need an arbitrary call primitive. As being said, we can have it by overwriting a function pointer. Does the struct netlink_sock structure hold any function pointer (FP)? The most obvious first solution would be to put an arbitrary value in place of netlink_rcv function pointer. This FP is invoked by netlink_unicast_kernel(). However, using this primitive is a bit tedious. In particular, there are lots of checks to validate AND it has side-effects on our structure. The second most obvious choice would be the function pointers inside the netlink_callback structure. Again, this is not a "good" call primitive because reaching it is complex, it has lots of side-effects and we need to pass lots of checks. The solution we choose is our old friend: wait queue. Hmm... but it does not have any function pointer?! wait_queue_func_t func;               // <------ this one! In addition, we already know where this function pointer func is called (__wake_up_common()) and how to reach it (setsockopt()). If you don't remember how, please go back to part 2. We used this to unblock the main thread. Again, there are always multiple ways to write an exploit. We choose this way because the reader should already be familiar with the wait queue now even though it might not be the optimal one. There are probably simpler ways but this (at least) works. Furthermore, it will show how to mimic kernel datastructure in userland (a common technique). In the previous section, it has been established that we will get an arbitrary call primitive with the help of wait queue. However, the wait queue itself does not have function pointer whereas its elements do. In order to reach them we will need to setup some stuff in userland. It will require to mimic some kernel data structure. We assume that we control the data at offset wait (i.e. the wait queue "head") of a kmalloc-1024 object. This is done via reallocation. Let's look back at the struct netlink_sock. Note one important thing, the wait field is embedded inside netlink_sock, this is not a pointer! WARNING: Pay special attention (double check) if a field is "embedded" or a "pointer". This is a source of bugs and mistakes. - __wake_up_(&nlk->wait, TASK_INTERRUPTIBLE, 1, NULL)           // <----- deref "slock"
The ultimate arbitrary call primitive will be invoked at . NOTE: If you do not understand the list_for_each_entry_safe() macro now, please go back to the Doubly Linked Circular List Usage section. That is, we will overwrite the next and prev field of the wait_queue_head_t (i.e. wait field) and make it point to USERLAND. Again, the wait queue element (curr) will be in USERLAND. Because it will point to userland, we can control the content of a wait queue element, hence the arbitrary call. However, __wake_up_common() poses some challenges. Since doubly-linked lists are circular, it means that the last element in the wait queue list need to point back to the head of the list (&nlk->wait). Otherwise, the list_for_each_entry() macro will loop indefinitely or eventually does a bad deref. We need to avoid it! The nr_exclusive argument is set to one during __wake_up_common() invokation. That is, it resets to zero after the first arbitrary call. Setting the WQ_FLAG_EXCLUSIVE bit is easy, since we control the content of the userland wait queue element. Finally, the restriction about the return value of (arbitrary) called function will be considered in part 4. For now, we will assume that we call a gadget that returns a non-zero value. In this article, we will simply call panic() which never returns and prints a nice stack trace (i.e. we can validate the exploit succeeded). Next, because this is the "safe" version of the list_for_each_entry(), it means the second element of the list will be dereferenced BEFORE the arbitrary call primitive. That is, we will need to set proper value in the next and prev field of the userland wait queue element. Since we do not know the address of &nlk->wait (assuming dmesg is not accessible) AND have a way to make the loop stop with , we will simply make it point to a fake next wait queue element. WARNING: This "fake" next element must be readable otherwise the kernel will crash because of a bad deref (i.e. page fault). This will be explained in deeper detail in part 4. In this section we saw what should be the value in the next and prev field of the reallocated netlink_sock object (i.e. pointer to our userland wait queue element). Next, we saw what was the pre-requisites in the userland wait queue element to access the arbitrary call primitive and get out of the list_for_each_entry_safe() macro properly. It is time to implement it! ffffffff810618da:       48 8d 42 e8             lea    rax,[rdx-0x18]           // retrieve "curr" from "task_list"
ffffffff810618de:       49 39 d5                cmp    r13,rdx                  // test "pos != wait_head"
ffffffff810618eb:       eb 0a                   jmp    0xffffffff810618f7       // start looping! ffffffff810618f7:       44 8b 20                mov    r12d,DWORD PTR [rax]     // "flags = curr->flags"
ffffffff810618fa:       4c 89 f1                mov    rcx,r14                  // 4th argument "key"
ffffffff810618fd:       44 89 fa                mov    edx,r15d                 // 3nd argument "wake_flags"
ffffffff81061900:       8b 75 cc                mov    esi,DWORD PTR [rbp-0x34] // 2nd argument "mode"
ffffffff81061903:       48 89 c7                mov    rdi,rax                  // 1st argument "curr"
ffffffff8106190d:       41 83 e4 01             and    r12d,0x1                 // test "flags & WQ_FLAG_EXCLUSIVE"
ffffffff81061913:       83 6d c8 01             sub    DWORD PTR [rbp-0x38],0x1 // decrement "nr_exclusive"
ffffffff81061919:       48 8d 43 18             lea    rax,[rbx+0x18]           // "pos = n"
ffffffff8106191d:       48 8b 53 18             mov    rdx,QWORD PTR [rbx+0x18] // "n = list_next_entry()"
In addition, we know that the "task_list" field in the wait_queue_head_t structure is located at offset 0x8. This was quite predictable, but it is important to understand the code in assembly in order to know where exactly the arbitrary call primitive is invoked (0xffffffff81061906). This will be very handy when debugging. In addition, we know the state of various registers which would be mandatory in part 4.
wake_up_interruptible(&nlk->wait);    // <---- first arg has our offset! Function, netlink_setsockopt() is larger than __wake_up_common(). If you don't have a disassembler like IDA, it might be harder to locate the end of this function. However, we do not need to reverse the whole function! We only need to locate the call to wake_up_interruptible() macro which invokes __wake_up(). Let's find this call! Our intuition was good the offset is 0x2b0. Good! So far we know what is the offset of wait in the netlink_sock structure, as well as the layout of a wait queue element. In addition, we precisely know where the arbitrary call primitive is invoked (ease debugging). Let's mimic the kernel data structure and fill the reallocation data. If the condition is true, it will try to declare an array with a negative size which produce a compilation error. Pretty handy! On the other hand, if you would like to mimic netlink_sock, you would need to insert some padding to have the correct layout, or worst, re-implement all the "embedded" structures... We won't do it here since we only want to reference the "wait" field and the "pid" and "groups" fields (for the reallocation checker). See how this is less error-prone than hardcoded offset? It is time to launch the exploit and see if it works! Because the kernel crashes, you might not have the time to see the dmesg output from your virtual machine. It is highly recommended to use netconsole! NOTE: We don't see the "reallocation succeed" string because the kernel crashes before dumping it to the console (it is buffered however). VICTORY! We successfully called panic() from netlink_setsockopt()! Wow... It was a long run! In this article we saw lots of things. First, we introduced the memory subsystem while focusing on the SLAB allocator. In addition, we saw a critical data structure used all over the place in the kernel (list_head) as well as the container_of() macro. Secondly, we saw what was use-after-free bug and the general strategy to exploit them with type confusion in the Linux kernel. We emphasized the general information required to gather before trying to exploit it and saw that KASAN can automate this laborious task. We gathered information for our specific bug and exposed several methods to statically or dynamically find the cache object size (pahole, /proc/slabinfo, ...). Thirdly, we covered how to do reallocation in the Linux Kernel using the well-known "ancillary data buffer" gadget (sendmsg()), saw what was controllable and how to use it to reallocate with (almost) arbitrary content. The implementation showed two simple tricks to minimize reallocation failure (cpumask and heap spraying). Finally, we exposed where all our uaf primitives were (the primitive gates). We used one to check the reallocation status (uncontrolled read) and another (from wait queue) to gain an arbitrary call. The implementation mimicked the kernel data structure and we extracted our target specific offset from assembly. In the end, the current exploit is able to call panic(), hence we gained control over the kernel execution flow. In the next (and final) article, we will see how to use this arbitrary call primitive to take over ring-0 using stack pivot and ROP chain. Unlike userland ROP exploitation, the kernel version has some extra requirements and issues to consider (page faults, SMEP) that we will overcome. In the end, we will repair the kernel so that it does not crash when the exploit exits and elevates our privileges. Hope you enjoy this journey in the Linux kernel and see you in part 4.